This photo snappin' gal is Jeannie and she is visiting the USA! She is from the Moonlight Whispers Travel Girls Series designed by artist Annie Rodrigue for Kraftin Kimmie Stamps! The size is approximately 3.75 x 2 inches and you will receive this stamp in unmounted deeply etched grey rubber. 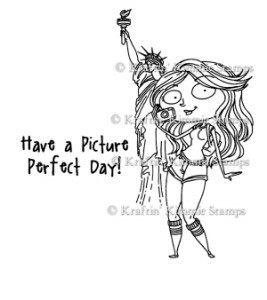 You will also receive the coordinating sentiment stamp,Have a Picture Perfect Day!